The Deputy of Bandit Bluff up and left his post! 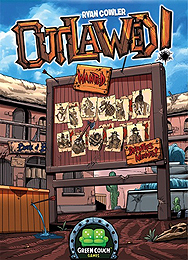 Looking to fill the vacancy, Sheriff Croc Holliday has put a pool of new recruits to work helping clean up some of the most wanted outlaws and will choose the most dedicated to be the new deputy. A little lying, some stealthy scheming, and the sense to know a good time to tell the truth might just help give a leg up over the rest of the herd. Who will out-law the other applicants to become the new deputy?